Home >> >> Leash Aggression: What Is It and How Can I Control It? Leash Aggression: What Is It and How Can I Control It? The term leash aggression is used to describe dogs that bark, lunge, pull, and carry on, in a reactive and escalated state, toward another dog (or person) while they are attached to a leash. These type of intense behaviors usually don’t exist when the leash is absent from the equation; it’s very possible for a dog to be friendly and playful at a leash-free dog park and still show signs of leash aggression on walks. There are several causes and reasons why dogs are leash aggressive, here are a few. Frustration – Dogs that typically are given free run of everything (backyard, every room in the house, doggy door, never crated) are very rarely denied the ability to move where they want, when they want; there is never the need to practice self-control. These dogs show signs of leash aggression when seeing another dog because the leash is physically restricting them from greeting the other dog. This frustration displays itself in this big display of lunging and barking in attempts to greet the other dog. It is not recommended to intro two dogs on leash if one is leash aggressive. Poor Socialization – Dogs that have not been exposed to a lot of dogs, people, and places at young ages tend to have leash issues. The lack of socialization makes the sight of a new dog a very exciting and intense occurrence, all that excitement overwhelms the dog because they have never had the chance or been taught how to deal with it. Lack of a Structured Walk – Walking with your dog while they are in a heel (position relative to your body, slack in the leash, attention forward, etc) helps keep the dog focused and non-reactive. This makes passing other dogs and people a non-issue because there has been structure and self-control before, during, and after you pass another dog. On the other hand, dogs that are constantly pulling and walking far ahead of their owners are free from control and are already amped up, guess what happens when another dog comes into sight? Window Barking & Fence Fighting – Constantly staring out of the window and barking at every dog that walks by or running the fence line in the yard with the neighbor dog can also add up to leash aggression. If your dog’s main interactions with other dogs are through a fence or at the front windows, how do you think they will react when seeing one on a walk? 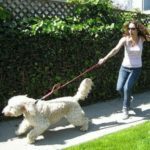 Although leash aggression can be extremely frustrating for you and your dog while out on walks, there are definitely some things you can do to help reduce your dog’s reactivity and make your walks more enjoyable. Make sure you are using the correct leash – Dogs that are reactive on leash (or any dog for that matter) should not be walked on a retractable leash as they don’t do you any favors in helping to maintain a structured walk. Instead, select the right leash for your dog and keep him focused and moving forward. Your walk starts before you leave the home – A dog that charges out of the front door pulling their owner behind is already in an amped up state of mind. It’s much harder to bring your dog back from chaos then it is to keep them from ever entering that state of mind. Even if it means turning around several times and rehearsing walking through your doorway, make sure you exit the home with your dog in a controlled position. Learn to control your dog’s head – Your dog’s head is the GPS of everything. It gives you info on where he or she is going to turn, or where he’s thinking about going, and it tells you everything that is coming up next. Remember, your dog gives signs of what they are about to do, you will see those signs by watching your dog’s head. This is crucial when dealing with leash aggression because interruption is much better then damage control. Train in an environment where your dog can be successful – A dog park or busy hike and bike trail is not the appropriate starting place for a dog working through leash aggression. Sue there have to be distractions and temptations but they need to be increased and decreased as needed. A training facility may be the best location for this type of control as random dogs in neighborhoods may be few and far between or even reactive themselves. Consult with a professional trainer – Reading these articles will hopefully be able to give you some insight on dealing with leash aggression but it’s not intended to be a DIY guide to solving the issue. Do your research a find a professional dog trainer that can help you achieve the training goals you have for your dog.